Delivery of the EPS panel are by articulated vehicle, separate to the beam delivery, and can be offloaded by hand or using on site machinery. The panels are supplied with the correct quantities for the specific call off. Each of the shrink wrapped packages are labelled with the depth and type of the product and the corresponding plots. 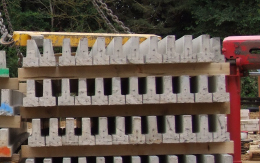 To avoid problems and additional costs at a later date we ask that the number of beams, packs of EPS panels and the ancillary items are counted and signed as received by an authorised signatory. 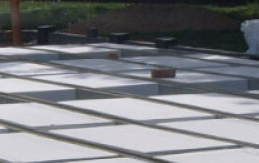 Polystyrene panels are supplied plastic shrink wrapped, but are otherwise unprotected. 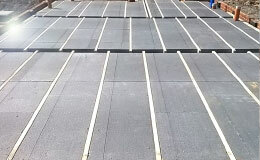 Panels should be stacked on firm level ground & protected against prolonged sunlight, wind and rain damage. Due to the number of panels sections available each pack contains one type of panel and is colour coded and labelled with the type and plot numbers for the call off. This ensures that the panels are used for the allocated area reducing the possibility of error on site. 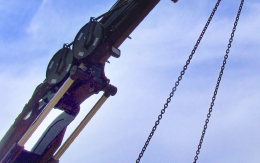 Care must be taken not to overload the floor beams or panels during the construction period. The floor has been designed to withstand light foot traffic. Temporary boards should be used in all other instances. 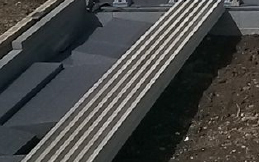 Spot boards should be used to receive the concrete from the chute. CUBE6 are proud of our commitment to reducing its impact on the environment. We are also mindful of our customers responsibilities for the reduction of waste on site and the subsequent path of the material to land fill or recycling facilities. 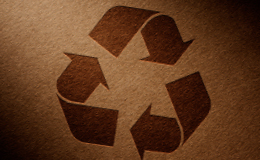 We therefore offer a collect and recycling service for polystyrene panels. This waste is then recycled and reformulated into other polystyrene products. 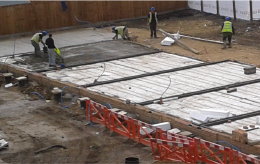 Prior to call off and commencement we recommend all the plots are ready to take the delivery of the beams and panels. We would ask that the supporting structure is complete ready to receive the beams and that an additional level of blocks are laid parallel to the span of the beams to support the edge of the Starter Split panel indicates as A-A, C-C on the layout drawing. Start points for the precast concrete beam positions are defined by a triangle within each of the ‘Bays’. The panel can only be laid in one direction in each ‘Bay’ and is defined by a indicative section. With the first few beams loosely positioned, the Starter Panel panels can be placed between the first beam and the wall and the beam pulled into final position ensuring that the panels fit securely. From this point the beams and panels should be laid consecutively until the last beam in the ‘Bay’ where an End Split panel is cut to suit the final distance from the beam to the wall edge. Once all the panels have been installed the closure blocks can be mortared bedded in between the beam ends as defined as a ‘x’ on the layout. A layer of coursing bricks are then be placed along the internal wall to bring the whole structure upto the top of the concrete level. Polystyrene perimeter strips are then placed in front of the bricks/blocks ready for the structural topping. 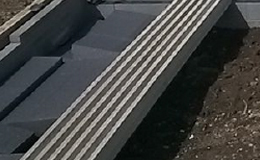 EPS Panels are supplied in 6 sizes, they are 1200mm long and are installed to suit the beam layout. Pre-cut starter panels are also supplied to start each 'Bay'. At the end of each row of beams the panel will need to be cut to suit. These cut panels should be placed at the end of the next matching row against the external wall before any new full panels are cut. This will reduce wastage on site. Installers should be made aware of the areas where cut panels exist and extra care taken to avoid damage. EPS panels can be easily cut to accommodate service positions. Re-use all cuts prior to using new panels. 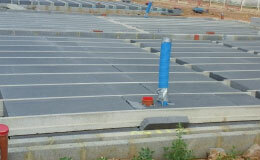 Closure blocks to be bedded and installed to the loadbearing external walls only. Internal loadbearing walls must be built through to the foundations by filling the gap with concrete with the polystyrene panels acting as a shutter. 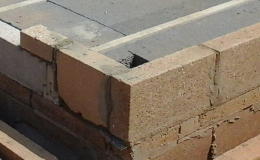 Where there are no walls, or non-loadbearing walls, over the internal sleeper wall the 150mm deep polystyrene Filler Panel can be cut to fill the gap. 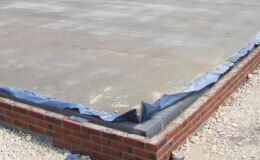 – 75mm thick C28/35 self-leveling /self-compacting concrete* reinforced with mesh. Where underfloor heating pipes are to be installed the concrete topping will need to be increased to allow 60mm of concrete over the top of the pipes. 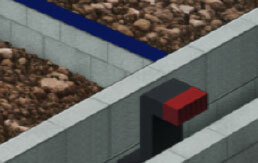 Only staple systems can be used with CUBE6 Thermal Floor.